There's nothing better than home made cookies, served warm right out of the oven. I don't know of anyone who doesn't absolutely LOVE them. I always like to time them so that I'm walking out the door minutes after I take them out of the oven, and then I cover them with a clean dish towel to keep them warm. When I arrive at a party with a tray of cookies, everyone always says "OH! they're still warm!!!". How divine is that? Sometimes I'll even whip up a batch and bring them to the Ritz if some of my friends are opening a show. It's just my way of saying "Have a great show! And just maybe it helps to calm some opening night jitters. Isn't it amazing how something as simple as a warm cookie can have such an effect? Quick true story....a few years ago, when I was selling my condo, I always made sure I had some cookies baking whenever a potential buyer came over for a walk through. As soon as they'd walk in, they'd smell the cookies baking and feel right at home. Clever, huh? And guess what, it worked liked a charm! My condo sold in just over 2 weeks! So keep that in mind the next time you go to sell a house! This was the recipe I used. 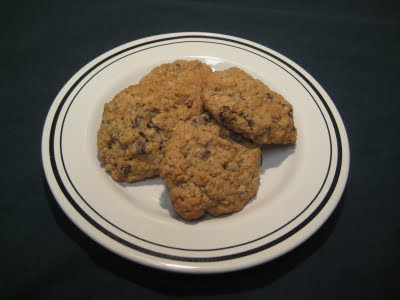 It's definitely my go-to recipe for oatmeal cookies. I've tried several other recipes, and this one wins. You just can't beat 'em! In large bowl, beat butter and sugars on medium speed of electric mixer until creamy. Add eggs and vanilla; beat well. Add combined flour, baking soda, cinnamon and salt; mix well. Add oats and raisins; mix well. Even though the recipe only calls for a cup of raisins and a teaspoon of cinnamon, I always add more. Remember what my Mom always used to say: "Do you like a lot? add a lot!"